Happy Thanksgiving!! I love this time of year. We are so incredibly blessed and have SO much to be thankful for. I’m thankful for a loving husband, a sweet daughter, and amazing family all around me. I’m thankful for a warm cozy house. And most of all, I’m thankful for a God who loves us! What are you thankful for? I know it’s a little ironic that it’s technically not even Thanksgiving yet, and I’m sharing a Christmas decoration with you. Poor Thanksgiving gets thrown under the bus with Black Friday and Christmas events starting already! But, it’s still important for us to stop and remember what we’re thankful for. And, because it’s Thanksgiving, I’ll be taking Friday off as well, so this’ll be my only post this week! I’ll be back on Sunday just in time for Motivational Monday! 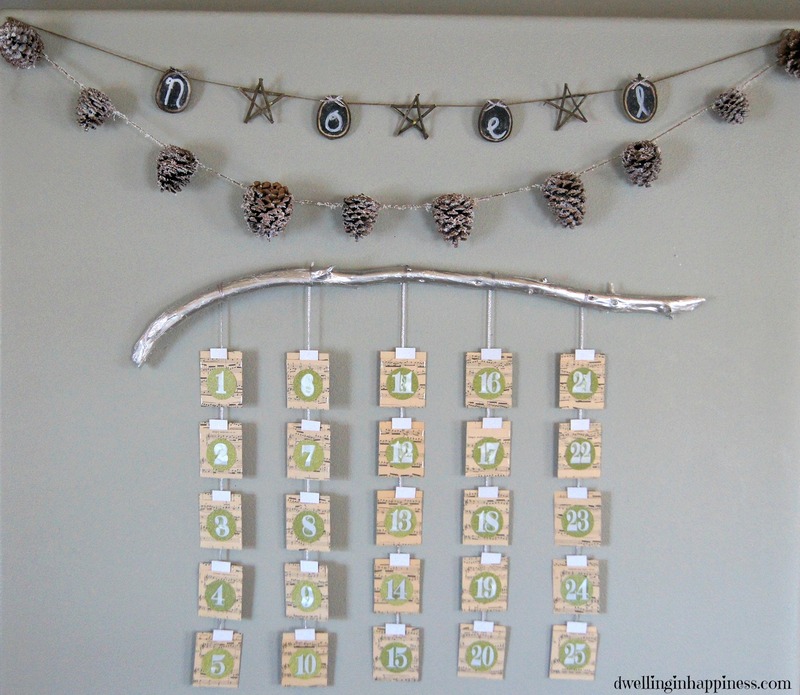 Last week I shared my Bible Verse Advent Calendar shown above, and I mentioned in the post about a tutorial coming on my pinecone garland. 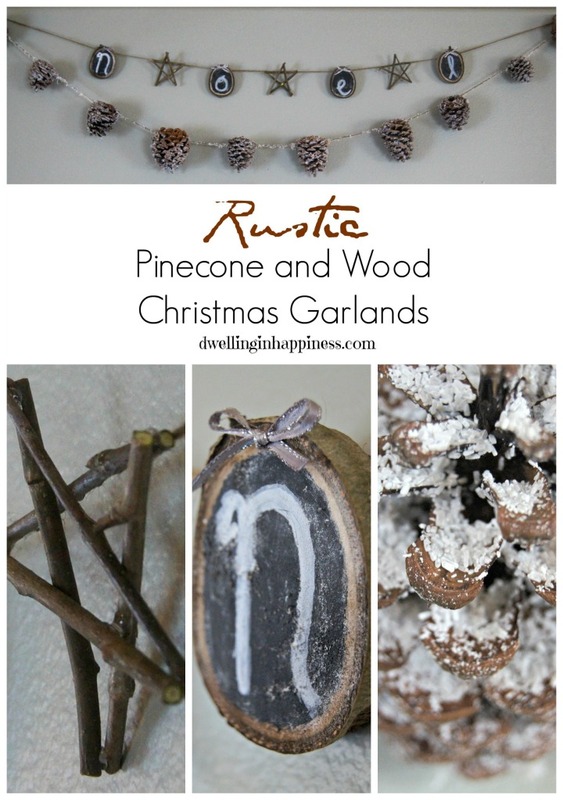 Well, I added another little garland as well to make these two rustic pinecone and wood Christmas garlands! I love the combination of the two together! To start, you need several pinecones. You can buy them in bags at any store, but I just went outside and picked up a bunch. I made sure they were shaken off and bug-free. I actually made this garland back when I shared my Camping Themed Baby Shower, so I don’t have many pictures of the process. To make the garland, I just used some twine, wrapped it around the thicker top part of the pinecone, and made sure the twine was pushed in well. I used some hot glue and glued under the twine between the little pinecone sections to ensure it would stay. 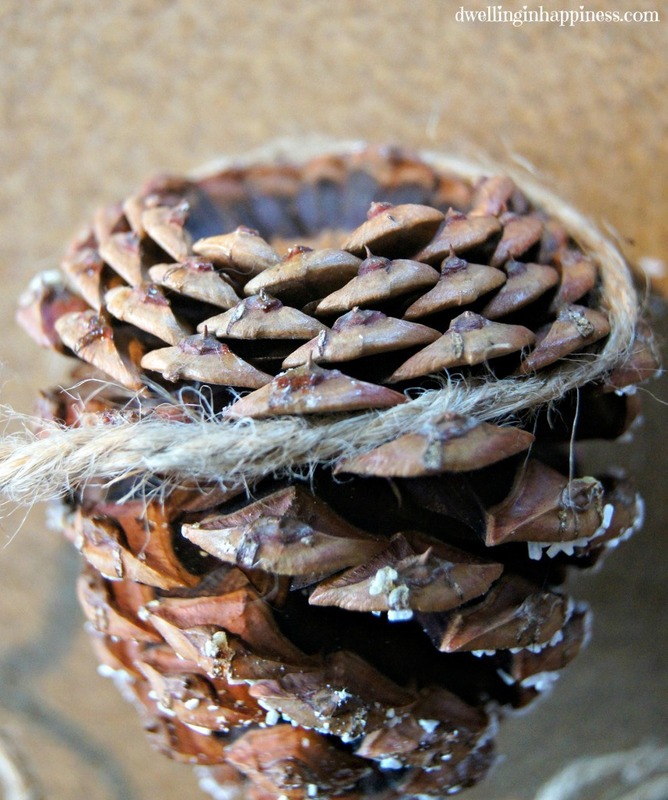 There’s lots of different ways you can actually attach the twine to the pinecones, but this method worked well for me. You’ll definitely want to use a lot of hot glue though, because the more pinecones you have on your garland, the heavier it will be. I left a few inches of space between each pinecone. After you have the desired amount of pinecones glued to the twine, it’s now time to add some “snow.” You could easily buy the fake snow spray which would work great. I didn’t have any on hand and I wanted a little more texture, so I used Epsom salt. I sprayed each pinecone with spray adhesive really well, and then dipped the whole cone into a big bowl of Epsom salt. I just rolled it around until I had the amount I wanted glued on. Shake it really well, as the salt fall off easily. You can even give the pinecone another thin coat of the spray adhesive after it’s covered, to make sure all the salt sticks. You’ll still have some fall off, but once it’s hung and you’re not handling it anymore, they’ll stay. Isn’t it pretty? I even glued some salt to the twine, but you could easily skip that step. Because I had my garland already put together, I glued on the Epsom salt after. 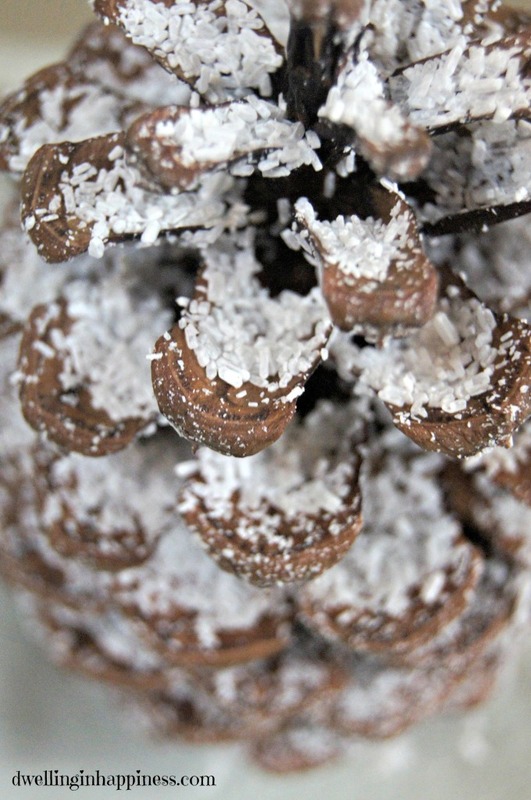 It might be easier to glue the salt onto the pinecones first, then glue the pinecones to the twine. But that’s entirely up to you! For the wood slice garland, I used a small stump from a pretty birch tree that fell on my neighbors property. He kindly cut me a bunch of wood and sticks; a crafter’s dream! I’ve slowly been finding uses for them all. We cut four 1/2 inch wood slices from the stump. I let them dry out a few days before I painted. 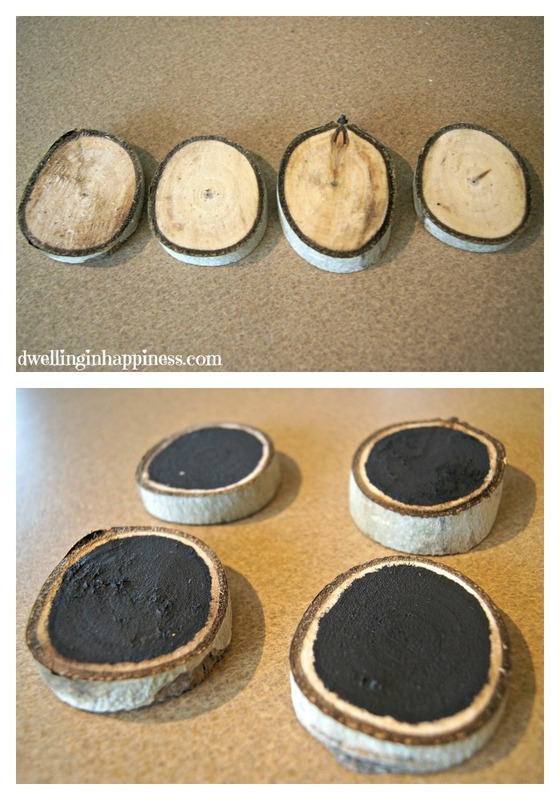 Using chalkboard paint, I free-handed the centers, leaving just a tiny edge of the wood unpainted. 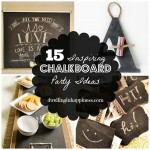 I’m obsessed with chalkboard paint! After that dried, I primed the surface by rubbing chalk all over it and wiping it off with a towel. I used a chalk pen and wrote the letter’s for “Noel” on each slice. I also added a little silver bow to the tops to add a little sparkle. Using some sticks from my wood pile, I made little stars to add to the garland. I cut 5 smaller sticks all the same size, and used hot glue to glue the ends of the sticks together to make a star. So easy! I just glued twine to the backs of each wood slice and star, and I had myself a little rustic wood slice garland! I LOVE how the two garlands look together, and how it just finishes up the wall! I’m debating adding a little “snow” to the stars too, or giving them a coat of metallic silver paint. But for now, I like it how it is. What do you think? I’m slowly getting things out and ready to decorate for Christmas. You better believe that Friday is GO time! Christmas music will be on, a peppermint white mocha will be sipped, and decorating will be happening. I’m so excited! Have you started decorating for Christmas yet? I hope you all have a wonderful and safe Thanksgiving, friends!! 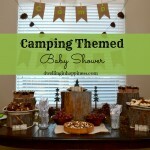 I link up at these fun parties, and Home Stories A to Z! 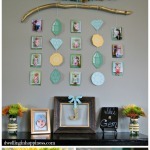 “She’s a Gem” Themed 1st Birthday! 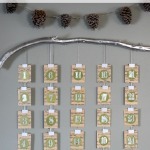 I love this rustic garland! I just bought some birch wood slices at Hobby Lobby, how awesome you had yours cut for free!! 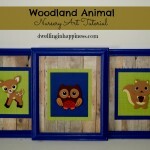 Carrie @ Curly Crafty Mom recently posted…Patterned Tops – 3 Bloggers. 2 Looks. 6 Styles. Thanks Carrie! I love that I had some wood lying around, but I know it won’t last long!! 🙂 Hope you had a fab Thanksgiving! Amanda I love how this turned out!! 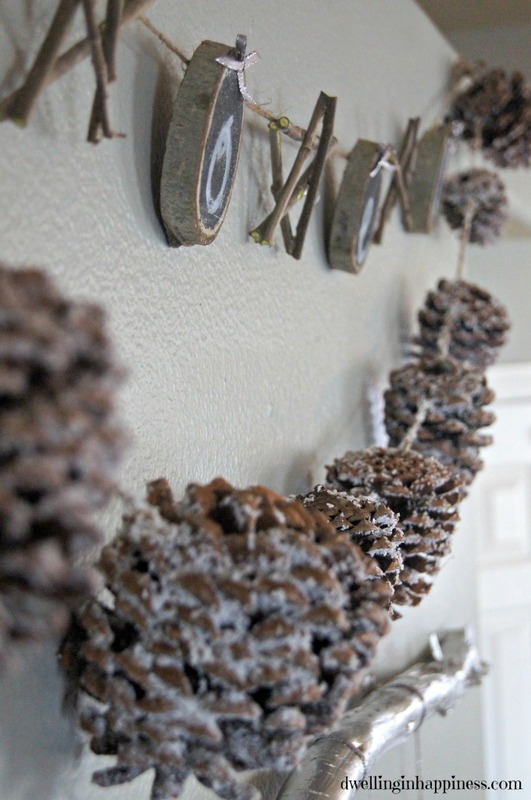 The silver added to the pine cones gives it such a great rustic feel!! I love your advent calendar too! Thanks Shonee!! I love pinecones in the winter, so pretty and reminds me of being out in the forest! 🙂 Hope you have a great weekend! Amanda these are so cute and rustic! I love that they are Christmas-ey but not too Christmas-ey. Great job!! Thank you Kendra!! I love those stick stars too, I think I’ll be making more of them for my decor this year! 🙂 We most DEFINITELY have a lot to be thankful for!! Erica recently posted…15 Fun Christmas Crafts! Thanks Erica! Haha, that snow ruins it sometimes!! I’d ship you some from my backyard, but ours are soaked from the rain we got yesterday. I feel like our weather should be swapped! 🙂 Hope you’re having a great week, friend! Thank you so much, Michelle!! You’re so sweet! I’ll be joining you again today for sure. 🙂 Hope your week is great so far! I’ve been seeing lots of great wood slice projects lately. I think I need to try some! This garland is so cute. 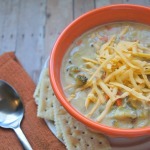 Thanks for sharing it with Hump Day Happenings! Thanks Jenna! Me too, so I had to try one!! Hope you have a great weekend! This looks so perfect! I love it! Pinned and tweeted. Thank you for being a part of our party. I hope to see you on Monday at 7 pm. It wouldn’t be a party without you! I love that you used natural elements to create a unique and rustic Christmas garland! I’ve pinned this awesome project to Your Designs This Time Features and Favorites board and we’ll be featuring it tomorrow! 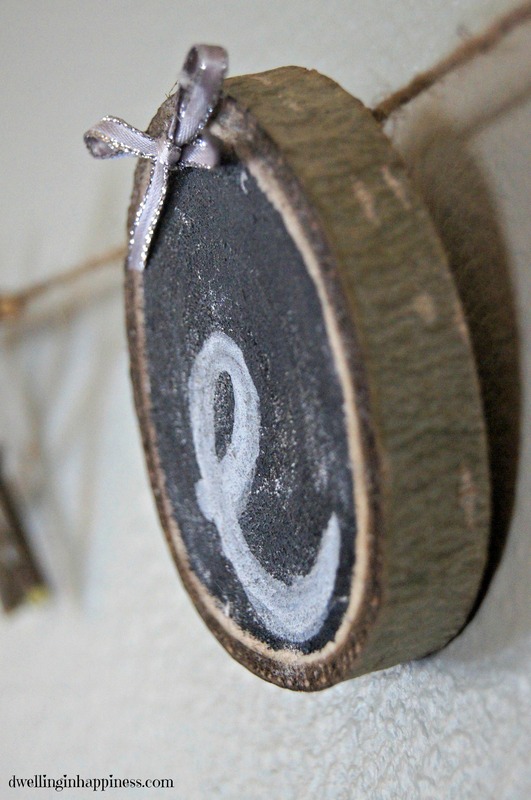 I love everything rustic and these are way too cute! Thank you for sharing on Show Me Saturday! 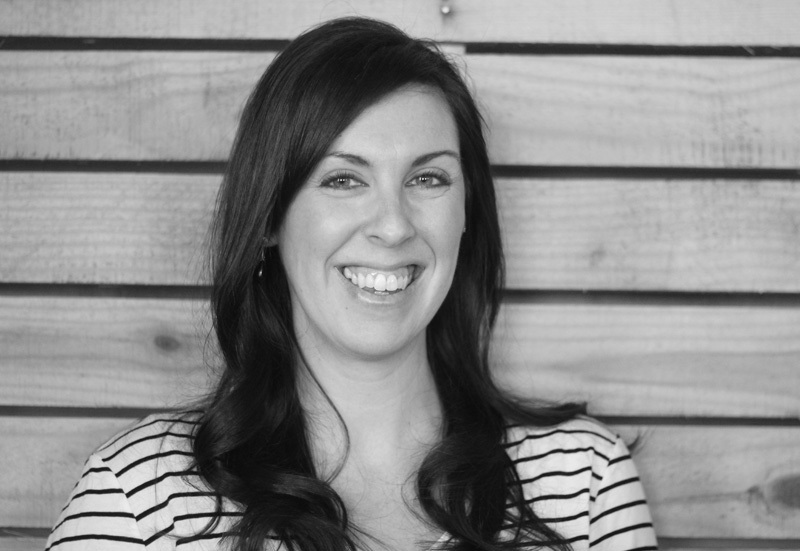 I love your style – Right up my alley! Thanks so much, Laura! I love pinecone garlands, they’re just so naturally beautiful! 🙂 Have a great Sunday!